On January 2, 2008, while on mission in Khowst Province, Afghanistan, an improvised explosive device hit the vehicle he was riding in, and he was severely injured. Collin was flown to Brooke Army Medical Center in San Antonio, Texas but the wounds he sustained were lethal resulting in his death on March 14, 2008. Two other soldiers, LTC Richard Berrettini of Wilcox, PA., and SGT Shawn Hill of Wellford, S.C. died in the January 2nd bombing. With only two weeks left in his year-long deployment in Afghanistan, he had begun preparations to return home having completed his last required mission. However, to ensure a smooth transition after his departure, SFC Bowen wanted to make sure that the team he was leaving behind was prepared for his departure, and volunteered for one final 10-day mission. Although his commitment to the army National Guard took him from his family, they always understood his need to serve his brothers-in-arms. Collin worked tirelessly to defend the country he loved so much, and his legacy of selflessness lives on in the family he left behind. “He taught me the biggest lesson of my life and my purpose is to continue his legacy by teaching our daughter to be the same selfless person that her dad was,” Collin’s wife, Ursula Bowen said. SFC Collin Bowen was 38 years old from Millersville, Maryland. 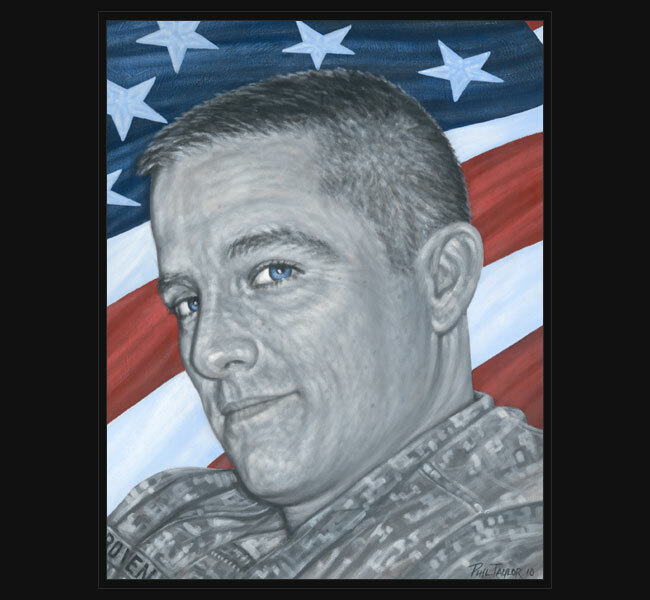 Original portrait was presented to his wife March 6, 2011 during a special event hosted by the Maryland National Guard in Baltimore, Maryland.